For a city as big as Hong Kong is, spread out across multiple islands, it is actually ridiculously easy and fun to get around Hong Kong. Seriously, it’s fun. 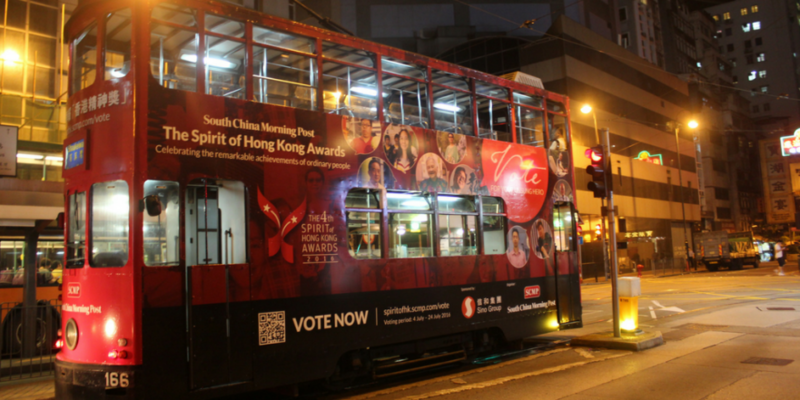 Hong Kong has made sure that its transport system is as iconic as the city it services. With fast trains and twisting stairways, rickety trams and hydrofoil ferries. Like so many other countries, Hong Kong has adopted a transport card which you can use for everything. You can even use this card to do your washing or enter some tourist attractions. Which is fabulous as it reduces lining up for tickets! First things first, if you are planning on staying in Hong Kong for more than a day, I recommend getting a tourist sim card for your phone. This is super easy at the airport, there are a number of retailers who do this. They work out the right plan for you, install the sim and make sure its up and working in the space of 10 minutes. Once you are all set up, you can start thinking about how to get to the city proper. When I was younger and first started travelling solo, I used to treat myself to a cab ride from the airport. My theory was that I was too tired for working things out and I needed the energy to orientate myself. In some countries, I still do this (Vietnam… it’s so much easier, plus it gives you a great perspective of the traffic). In Hong Kong, however, it is actually EASIER to catch the fast train. Head over to the train station and you will see giant machines with details on how to purchase your ticket. It is very easy and takes no time at all. Before you jump on the train go and see the people at the service desk that is right in front of the ticket machine and purchase your Octopus Card (your transport card). By doing it here you can just jump straight onto your next train/ferry/bus/tram at the other end. In almost no time you are arriving in Hong Kong. It stops off at Kowloon on the way if you are staying on that island. The train also has WiFi if you chose not to get a sim card. The fast train finishes up at Central. This is a pretty large station, with lots of exits and lines. Head to the underground trains, as nearly everywhere is accessible by these. Like the British system, it is easy to navigate thanks to the signs. Look at a map to work out which line you need to be on, then simply follow the colour coded signs to the platform. Once on the platform, there are markers to indicate where the doors will open and where you should line up. Pure efficiency. The trains themselves are high-tech and high speed. You will be at your station in next to no time. Everyone on the train is polite and helpful if you need some help working out where to get off – a local has never failed to assist me with a smile. I always say that the best way to get to know a city is on foot. Hong Kong is no exception. However, Hong Kong does make it easier for you. It has escalators in the street – enabling you to get up to the various different districts without having to sweat it out. Likewise, there are a number of bridges and flyovers that connect the various buildings so that you don’t have to go all the way back down to ground level every time you want to visit somewhere new. In fact, you can cut across whole suburbs without ever walking on the street, just by using the escalators flyovers. If you are like me, you will meander up and down, through laneways, across roads and end up where you started. Which is exactly where I found my favourite duck and pork rice place. Where ever you walk, your eyes will feast on the smorgasbord of colours and activity. By this point in the afternoon, it is too hot to trek aimlessly around the districts. Instead, it’s a great time of day to head into the central part of town and has a look around. 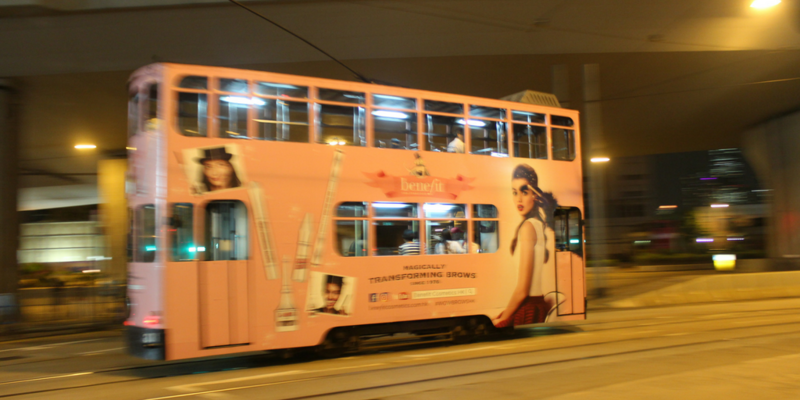 The best way to get there if you are staying on Hong Kong Island is by tram. The first time I caught one of these, I stood at the stop for ages trying to read the map in order to work out where I was and where I wanted to go. A lovely local interrupted me and told me just to get to the next one – they all go in the same direction. The best part about travelling at this time of day was that there was hardly anyone on it – leaving the top window seat free. This is by far the best seat in the house and is awesome. If you can, sit there, make sure you have your camera ready to take lots of snaps! After wandering around downtown and central market district it’s time to start heading across to Kowloon to go in search of the night markets and some dumplings. The best way to get there isn’t the most efficient but is the most beautiful. Head over using the ferry. There are different decks that are different prices depending on air-conditioning or views of the harbour. Going at this time of day is magical. Watching the sunset, reflecting off the big glass sky scrappers on either side of the harbour lends a kind of futuristic dream world feels about the place. I can honestly say that it is one of my favourite experiences in Hong Kong… and it cost me less than a $1! 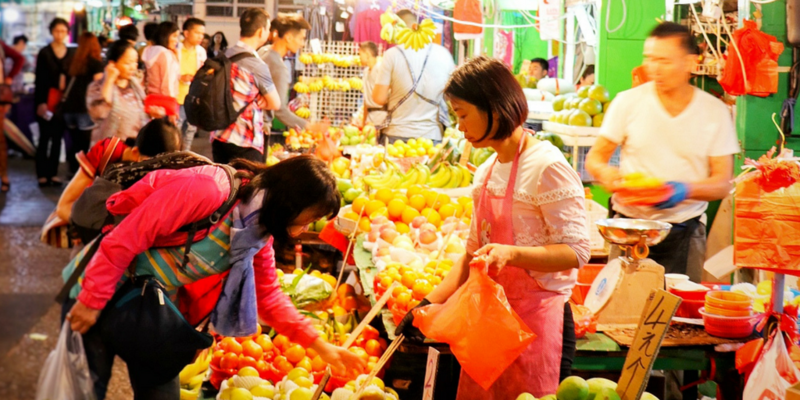 From the ferry terminal on Kowloon, you can easily walk to the famous temple street night market. When you find it, make sure you walk the streets either side of the market as many other stalls and shops have been drawn to the area. There are a couple of streets that are dedicated to your usual market knick-knacks. And a couple of streets dedicated to food and produce. Personally, I like these streets better as there are more active and people watching in them. I chose not to eat there but instead went and ate out on a friends recommendation – one of the best meals of my trip. Jump on the MTR (metro/subway) to head home. I am sure the ferry would be nice in the evening, but the train is quicker. However, I made a last minute decision and got off at Centrals and take the mid-levels escalators up to the bar district. My favourite bar is Soiree – they do amazing slushy cocktails. What makes them so fantastic is that instead of lining the glass with salt they line it with chocolate. This chocolate can change the whole flavour of the drink. Its an amazing and innovative way to cool down on a humid evening. I decide that on a beautiful night that I don’t want to get on the train… I am also too exhausted to walk home, so I catch the tram. If you manage to get the top front seat at night it is even more awesome than it is during the day! In no time I am back at my hotel for a good night’s sleep. 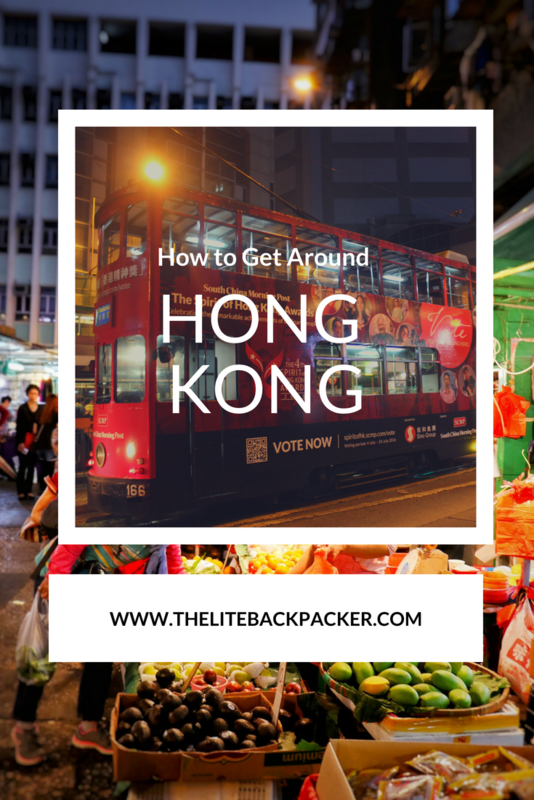 There are so many things to do in Hong Kong. Thanks to the brilliant transport system it is easy to access it all. Whether you like doing walking trails or maybe you want to climb Victoria peak. If you are feeling lazy you can even catch a cable car up Victoria Peak. Catch a hydrofoil super ferry and be in Macau in an hour for a day of shows! Or jump on different ferry’s and go and visit the other islands that make-up Hong Kong. Catch the trains to the end of their lines to look at neighbourhoods that aren’t in the travel guide. And walk, as much and as far as possible! Nice breakdown Helen. I love that shot from the ferry! Always easier to get out and about with easy transportation. The more dependable options the better I say, and Hong Kong has more than enough. Thanks Ryan! And I completely agree – it’s a fantastic and easy city to get around.